Porous polymer membranes are widely used in separation science, electrical and electronic systems, and in devices. Now, an international team has developed a membrane with micropores that can be switched between different shapes and sizes to expand the repertoire of such materials. Writing in the journal Angewandte Chemie, the team describes a process that allows them to make porous films using shape memory polymers of precise dimensions. They can then use light to reversibly change the shape and size of the pores. One block of the polymer network carries the light-sensitive, photoresponsive, side-chains with azobenzene units that can undergo cis-trans isomerization when light shines on them. The other block of the network carries crosslinks to bond it to the configuration of the film. The team shows that ultraviolet irradiation, or heat, will flip the azobenzene units to their bent cis form, while irradiation with visible light leads to preferential adoption of the straight trans form. Moreover, if that visible light is linearly polarized, the side chains will also undergo a rearrangement, lining up in parallel. It is these configurational changes at the molecular level in response to light that causes displacement of the material and so changes the shape of the micropores in the membrane. The team explains that by carefully controlling the direction of the light polarization, they can transform the initially round micropores into various different shapes, making them like a rectangle or rhombus with rounded corners. Subsequent heating or ultraviolet irradiation destroys the order of the side chains and the micropores then revert to their original shape and size. The team has shown that these transformations can be carried out repeatedly, which would obviously be critical for any technology utilizing the effect. In addition, the team also explains that they can pre-configure the copolymer film to give it a specific initial state, locked in through crosslinking but then just as facile in its photoswitching from micropores with that shape to yet another. 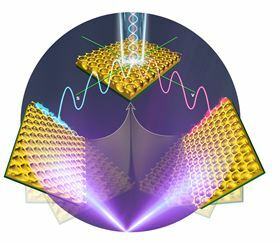 "Such light-driven smart membranes are promising for efficient separation and purification, and the strategy is prospectively adopted in constructing smart light-reversible nanostructures on surfaces," Lin told Materials Today. Subtle adjustments in the manufacture of a polymer-based carbon sorbent can optimize either carbon capture or methane flow.